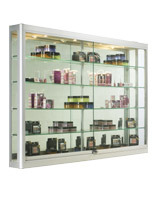 Extra-wide cabinet displays almost twice the merchandise of smaller styles! (4) 20-watt halogen top lights illuminate products from above! 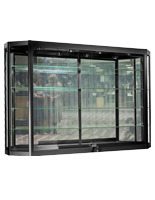 Wall-mounting cabinet saves floor-space to open up traffic flow within your store! Ships pre-assembled; just fill with merchandise! This wall cabinet is a great way to showcase a lot of products in a space that is normally only used for wall-art or signage. Instead of using precious floor space and crowding up your retail store, buy this wall cabinet to present items in space that is normally underutilized. 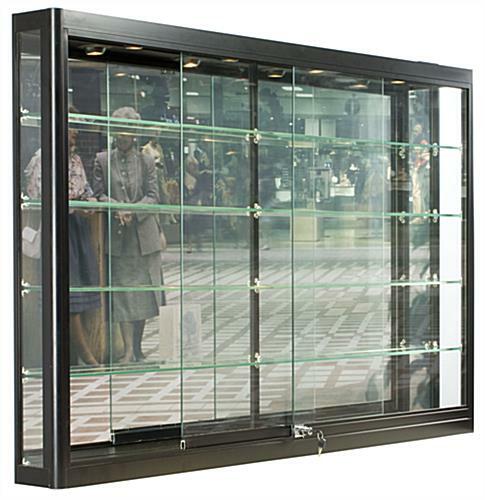 A wall cabinet, also known as a glass display cabinet, is a great addition to the area behind a cash register or checkout counter. Displaying items like cosmetics, jewelry or souvenirs on the wall behind a checkout counter can easily increase impulse purchases by your customers or patrons, adding dollars to their total without adding too much extra overhead on your end. 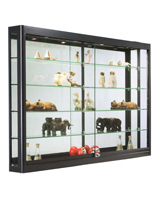 A cabinet is also great for displaying small trophies or awards in an office, school or business lobby, or showcasing collectibles or artifacts in a museum, theater or Hall of Fame. 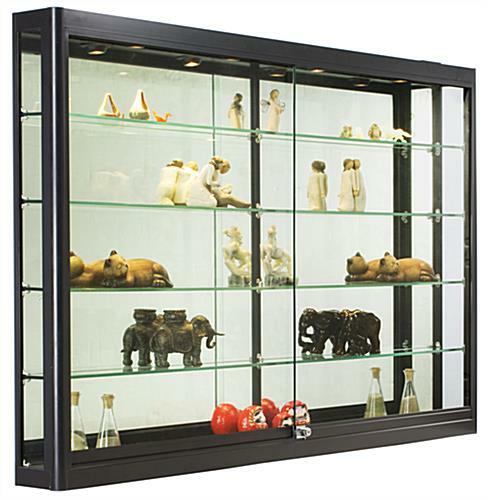 This glass display case, wall cabinet is well-equipped with many great features. 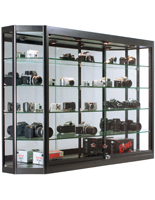 The wall cabinet is crafted from sturdy & durable black powder-coated aluminum and tempered glass, ensuring it will stand up to years of use, even in a busy store environment. The wall cabinet features four eyeball recessed 20-watt halogen top lights. These lights can be aimed towards the front or back of the cabinet to illuminate specific items. 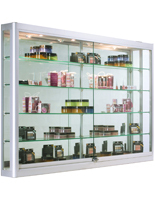 Four full-length glass shelves are fully height adjustable within the cabinet, so you can accommodate products of varying sizes. Sliding doors feature a plunger lock to prevent unauthorized access to displayed merchandise. The cabinet is affixed to your wall with two heavy-duty z-bar mounts. The wall cabinet ships fully assembled so you simply have to hang and fill it! 58.0" x 39.0" x 6.0"
Hi Brian, We're so sorry to hear your purchase arrived damaged. One of our customer care specialists will reach out to assist. Thank you for your patience.